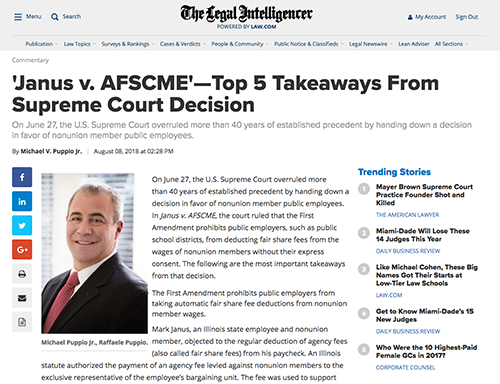 Raffaele Puppio founding partner Michael V. Puppio Jr. analyzes the Janus v. AFSCME Supreme Court decision in his latest article for The Legal Intelligencer. Puppio addresses the Top 5 Takeaways from the overruling of the 40-year-old established precedent. The ruling employed the First Amendment’s prohibition of public employers from taking automatic fair share fee deductions from nonunion members, and surrounds nonunion member Mark Janus’s objection to the regular deduction of agency fees from his paycheck. After a thorough analysis of the case and its path towards the Supreme Court, Puppio highlights the important takeaways and explains what this ruling means for union and nonunion members. This thorough analysis of the case provides a detailed summary, and offers the insight of a lawyer with two decades of legal experience. Puppio concentrates his practice in the areas of education law, municipal law, municipal finance, and litigation and is a well-respected legal professional in the Delaware County bar.